American Girl is proud to announce what's sure to be the most exciting debut in the company's 25 year history: two different historical characters, Cécile Rey and Marie-Grace Gardner, sharing one six-book series set in 1850s New Orleans. In conjunction with Cécile and Marie-Grace's debut, American Girl has partnered with world-renowned musician and actor Harry Connick, Jr. and his 13-year-old daughter Kate on an original song "A Lot Like Me", inspired by the new characters' story. The song is available exclusively on iTunes, with all proceeds benefiting the Ellis Marsalis Center for Music in New Orleans. I have always loved Harry Connick, Jr. and am happy to introduce my children to his music. The best artists transcend generations. What a wonderful way to help others, too! On August 29th, American Girl D.C. will host a special Cécile and Marie-Grace Charity Ball where guests will be among the first to celebrate our new historical characters, plus enjoy a New Orleans-themed meal, learn ballroom dance steps, make fun crafts, and more. A portion of the proceeds from the ball also helps support the Ellis Marsalis Center for Music. Girls and their dolls celebrate the arrival of these new dolls wearing their prettiest dresses at the Charity Ball. Everyone loves an opportunity to wear a beautiful dress. The new characters officially launch at the store on August 30th with a debut event from 11:00 a.m. to 3:00 p.m. featuring free crafts and giveaways. 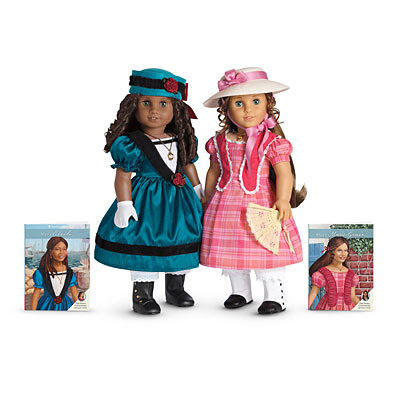 American Girl is well known for their historical characters. If you could introduce a new historical character, who would she be and when would her story take place? Oh my goodness, that is the cutest idea! American Girl has certainly become more clever and involved since I went through my doll phase. Can I be 10 again please??? How sweet, looks like it will be a wonderful event! Aww so sweet! I used to get to be a model in a charity American Girl Doll Fashion Show from ages like 10-13- best times of my life right there! !